Colour Combinations: So Many Options! Book your holiday lighting removal today! 1) The earliest and latest dates you would like the lights to stay up for (just say “anytime” if it doesn’t matter…you can simply unplug the lights when you are finished using them). 3) Any special notes or requests (i.e. – do you want some lights to stay up? Do you prefer morning or afternoon? Are you moving this year and will need a new design in 2018?). We will be mapping and labelling your strings so that we can install the lights the same way next season, so it’s helpful to know of any potential changes in plans. You do not have to be home during the removal as long as we have access to all the areas where lights are installed. 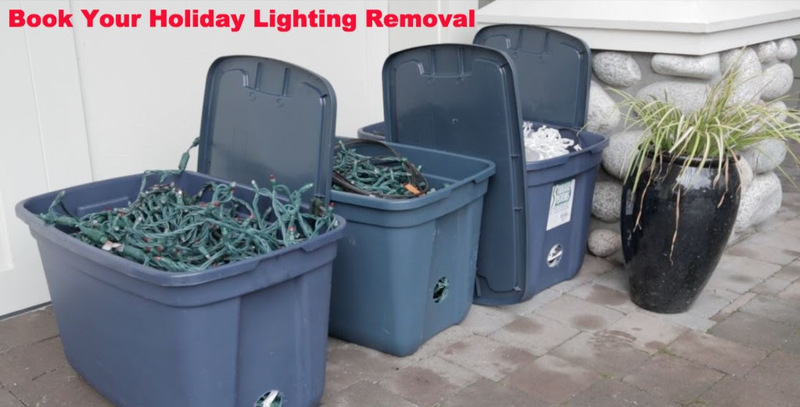 If you are storing the lights yourself, ensure they are “bone-dry” before closing the lid and storing them away. Any moisture will cause corrosion and the lights may not work again. Thank you for another great FestiLight season and all the best for 2019! We’re hiring Christmas light installers in Vancouver & Victoria!